Scotland's second local TV channel, STV Edinburgh, will launch on Monday 12th January at 7pm with the first ever broadcast of The Fountainbridge Show, the channel's new flagship evening magazine programme. The channel will be available on Freeview, YouView, Sky and Virgin Media across the Edinburgh area. Test transmissions are already on-air on Freeview channel 23 and follows last year's successful launch of STV's local TV channel for Glasgow. Edinburgh residents even had an opportunity a week ahead of the launch to be part of the opening titles for The Fountainbridge Show when filming of the titles took place outside Edinburgh's Assembly Rooms. 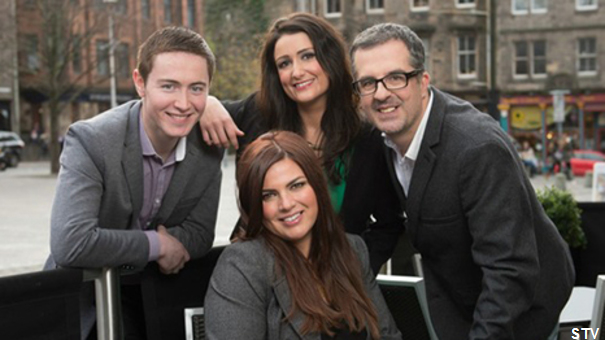 The Fountainbridge Show will be presented nightly from the studio by former Heart and Real Radio breakfast show host, Ewen Cameron and broadcaster and presenter Hayley Matthews. The Fountainbridge News will air from 6:30 – 7:00pm each evening, followed by The Fountainbridge Show from 7:00 – 8:30pm. STV Edinburgh's launch line up also includes Edinburgh’s Murder Mysteries at 9pm, STV Edinburgh News at 10pm and Peter & Roughie’s Football Show at 11pm. Popular archive programming will return to the STV Edinburgh schedule on Tuesday 13th January with the very first episode of Take the High Road at 5:30pm. STV Edinburgh will also broadcast one hour of non-English speaking content per week with Polish drama, Czas Honoru (Days of Honour), beginning on Friday 16th January, with subtitles. STV Edinburgh will be on air midday to midnight each day with an entertaining mix of news and features, live and interactive formats, and quality acquired and archive programmes. Paul Hughes, channel editor for STV Edinburgh said: “The response from local people to the launch of the brand new channel has been fantastic. We’ve been inundated with requests from local bands and chefs from the capital who want to appear on the The Fountainbridge Show which is really encouraging ahead of launch. The new channel will complement STV’s current portfolio of locally focused services on air, online and on mobile. STV has recently applied for further local TV licences, which would allow the broadcaster to launch similar local TV services in Aberdeen, Ayr and Dundee. Local TV is rolling out across numerous locations in the UK. Local TV stations already operate in the other UK capital cities: London Live, Made in Cardiff and NVTV Belfast. Available on all major digital TV services. Check your coverage and applicable channel numbers.